An Ocean City lifeguard was on a swim workout Friday morning when she discovered a dead shark in the surf near 130th Street. Beach Patrol Capt. Butch Arbin says she continued her workout and once back on shore, contacted the area supervisor. Capt. Arbin says bystanders assisted the beach patrol bringing the remains to shore. He said the concern was the same for any floating object in the water in that it could injure someone if it struck them as it was being pushed by a wave. 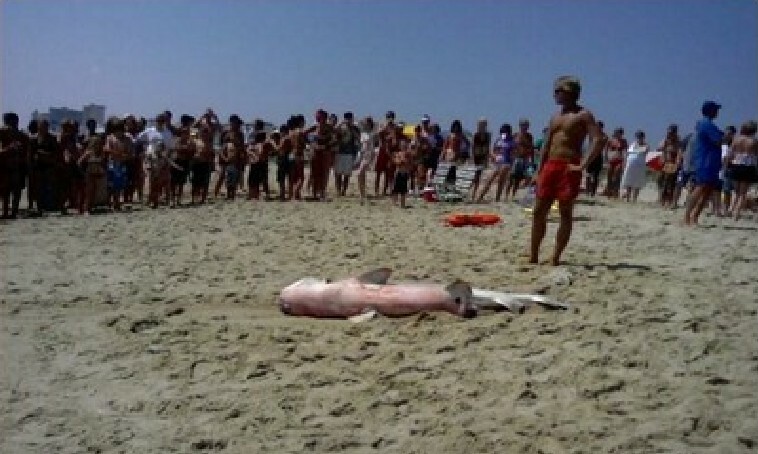 Once on the beach, water drained from the carcass. Escaping water flowed through the shark's gills which led some bystanders to believe it was still alive. However, Capt. Arbin says the supervisor on the scene has assured him that it was dead. He noted that the shark "had a very large hook and steel leader in its mouth." This type of tackle is typically used for off-shore deep-sea fishing, which takes place several miles off the coast. The shark was about five or six feet long and had not been positively identified but the supervisor said it may be a thrasher shark. This type of shark is not seen close to shore and poses no threat to humans, he added. The shark was too heavy to lift onto a beach vehicle, so the city's public works tied the tail and dragged it over the dune. The remains were taken to the dump. Had it been a mammal, Capt. 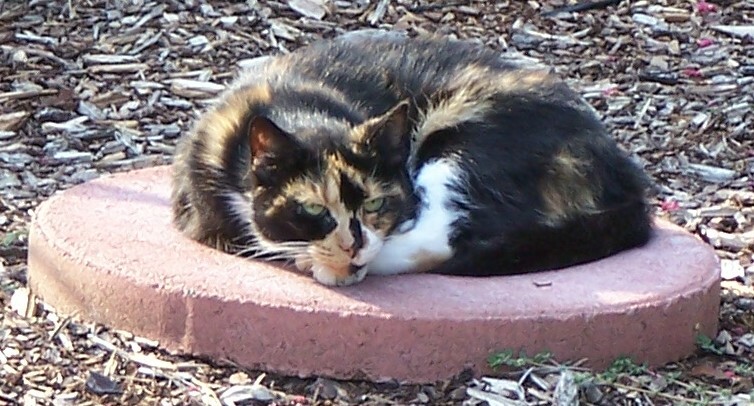 Arbin says it would have been taken for a necropsy (animal version of an autopsy). "People love sharks," Capt. Arbin added, as he received so many calls on Friday about the incident. 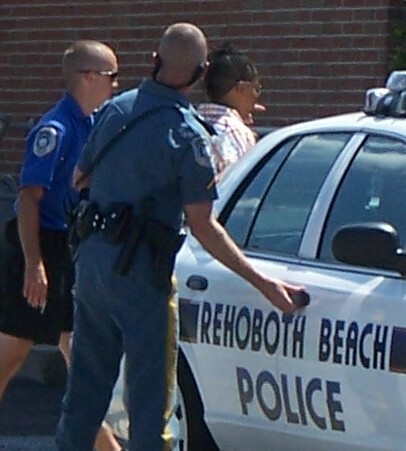 It took Rehoboth Beach police less than eight minutes to capture a burglary suspect Sunday afternoon. Police were sent to the 300-block of Hickman Street around 2:10 p.m. after the occupant of the house said she heard somebody banging on the door while she was in the shower. She said a woman had broken in the front door. That's when the occupant screamed and the female suspect fled. The occupant gave police a detailed suspect description -- hair braided up, silver sunglasses, long multi-color plaid collar shirt and yellow shorts. Police found her less than eight minutes later at the 7-Eleven on Rehoboth Avenue. That's where the victim identified the woman as the suspect. Police arrested her and took her to the police station for booking (photo above). DO YOU KNOW WHERE YOUR BIKE IS? 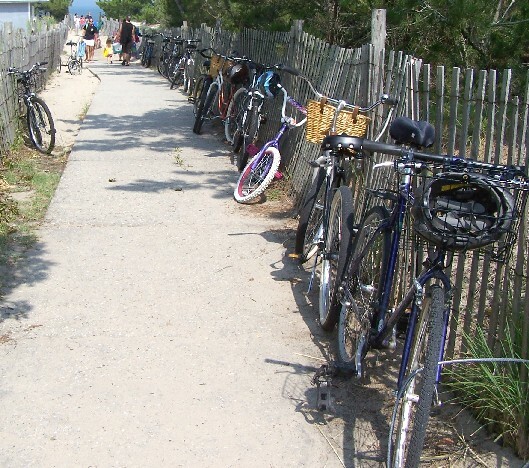 "I cannot understand why people do not lock their bikes when they leave them unattended," Rehoboth Beach Police Det. Kevin Jones wrote in last week's Neighborhood Watch Bulletin. He said five bicycles were stolen in the previous week. Three more were reported stolen this weekend, from Sussex Street and Grove Park. Ironically, the same day Det. Jones submitted that report, Ocean City police issued a news release reporting that the police are investigating a series of bicycle thefts throughout town. Between May 15 and July 28 the release says 78 bicycles were reported stolen. The majority of bike thefts took place in the south end of town, but five were taken from the Caine Woods area, seven in the 94th Street area, and nine in the 120th Street area. "In almost all of these thefts, the bicycles were not properly secured. Many were left in yards, on porches, automobile racks, or in unlocked bike racks," the release states. 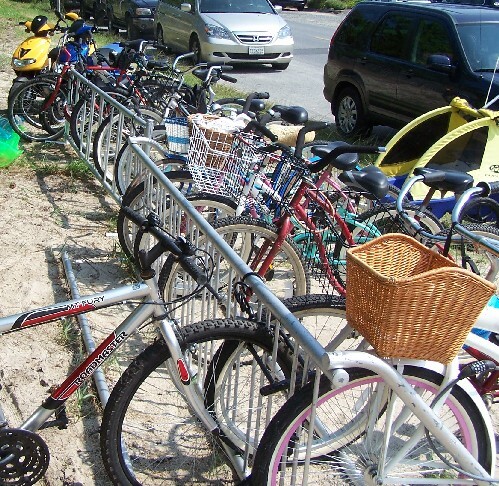 Ocean City residents are able to register their bicycles with the Ocean City Police Department at no cost. They will be issued a sticker to put on their bikes. Information about this program is available on the OCPD website. 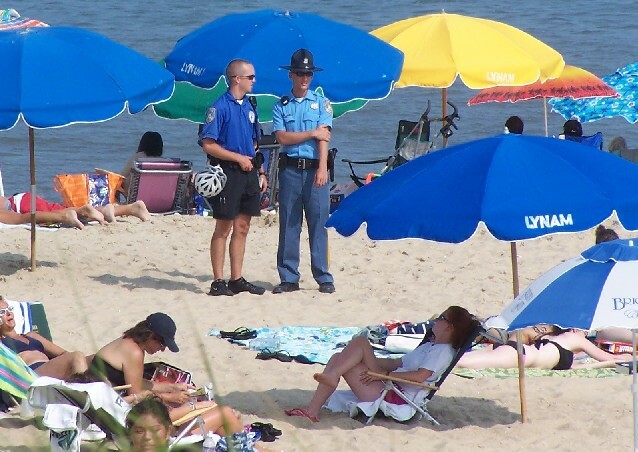 Rehoboth Beach has had a bicycle registration program in the past, Det. Jones said, but it was not successful although he says he has been considering restarting that program. Officers’ investigations are often hampered by owners who do not know the serial numbers of their bikes. Officers are not able to enter these stolen bikes into the NCIC (National Crime Information Center) computer without a serial number. This lessens the chance that a recovered bike would be returned to its owner. Just how many bicycles are left unlocked? 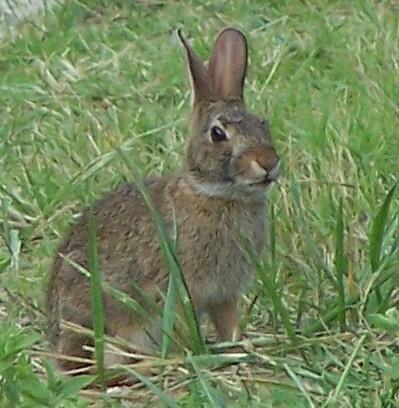 Here's a random sample from Saturday afternoon in the Deauville area. Of the 16 bikes shown below, eight were locked. Two of the five bikes on this rack at the foot of Oak Avenue were secured. Surprisingly, almost all bicycles at these two racks at the end of Park Avenue were secured. Only one of the 14 bikes was not! A uniformed police officer in dress shoes patrols the beach Saturday afternoon on the south side of town. He did ask one man for identification, and had the dispatcher perform a computer check to see if he were wanted. But the officer soon continued through the crowds of beach goers. 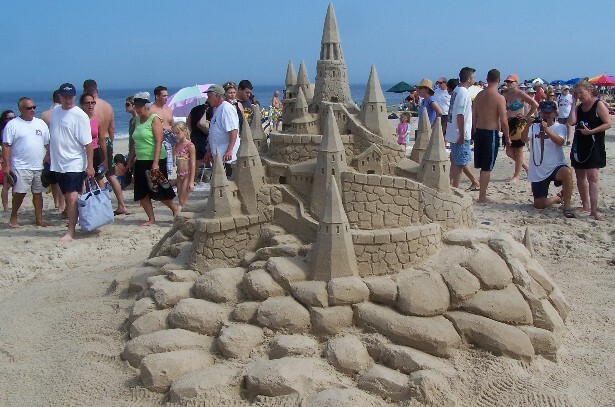 Saturday morning got off to a wet start, but that did not stop ambitious sand engineers from submitting more than 100 entries in the 30th Annual Sandcastle Contest held near Rehoboth's Henlopen Hotel. Sand creations included sea creatures, sand cakes, and the traditional sand castles. The judging (below) began around 3 p.m. in multiple categories. 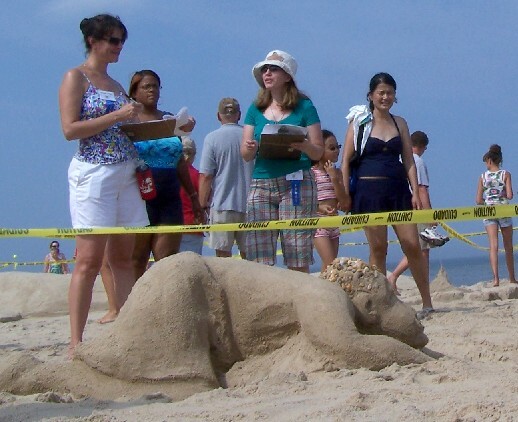 The sponsor, the Rehoboth Beach-Dewey Beach Chamber of Commerce, promises to post the 2008 pictures on its photo page (click "forward" at the bottom of the page until you reach Sandcastle Contest). A U.S. Marines CH-53E flew north over Rehoboth Beach Friday evening. The Sikorsky CH-53E Super Stallion (based around the Sikorsky S-80E) is the largest and heaviest helicopter in the United States military. The helicopter features a seven-blade main rotor assembly. The down-draft created by the main rotors is enough to knock people off their feet. Thus it has earned the nickname hurricane maker.